This coming Monday, September 30th, at 7:00PM, the UC Hopland Research & Extension Center will host another monthly evening seminar that is free and open to the public. 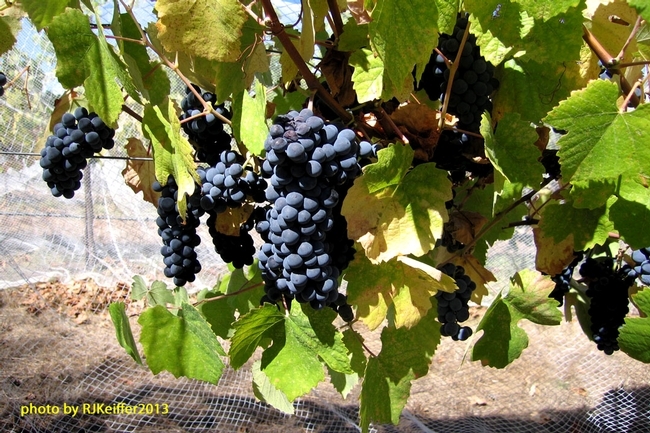 Glenn McGourty, renowned UC Cooperative Extension Viticulture and Plant Science Advisor for Mendocino and Lake Counties, will present "Back to the Future: Mediterranean Winegrape Varieties in Mendocino County". For almost three decades Glenn has conducted grape varietal research at HREC, with the current varietal trial looking at rather unknown Mediterranean cultivars such as Cielegiola, Graciano, Periquita, and Tocai Friulano to name a few. Typically, data is collected on phenologic characteristics (data of bud break, bloom, verasian, and harvest) and individual vine performance (cluster numbers, yield, pruning weights, berry weights, and juice analysis). Come and find out more this Monday evening at the Rod Shippey Hall. Light refreshments will follow ... see you there.